As the medical director of the inpatient family medicine teaching service at University Hospital and the hospitalist medical director at UW Health at The American Center, Nicole Bonk, MD, is a family physician who works entirely in the hospital setting. 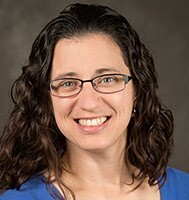 Nicole Bonk, MD, an assistant professor in the University of Wisconsin Department of Family Medicine and Community Health (DFMCH), has focused her career on being a family physician who works almost entirely in the inpatient setting. Since July 2017, she has been the medical director of the D4/6 unit of University Hospital and the inpatient family medicine teaching service located there. In April 2019, she also was named the hospitalist medical director at UW Health at The American Center. Hospital medicine has always been a part of Dr. Bonk’s career. After completing the DFMCH’s Madison family medicine residency program in 2012, she worked as a hospitalist in Monroe, Wisconsin, while also seeing patients at UW Health urgent care clinics. In 2015, she began attending on the inpatient family medicine teaching service at University Hospital. She also expanded her role to include a 50 percent appointment in the UW Department of Medicine’s Division of Hospital Medicine, working at UW Health at The American Center. In 2017, she became the medical director of the inpatient family medicine teaching service, which provides care for 14 to 16 patients from UW Health family medicine clinics and Access Community Health Centers. Patients are children and adults who have a broad range of diagnoses and who require general, nonsurgical care. On that service, family medicine residents have an opportunity to care for patients through the outpatient to inpatient spectrum in a busy, high-volume center—preparing them for future practice that, depending on their career goals, may include inpatient care. Noting that almost nine percent of family medicine residency graduates nationwide now go on to work as hospitalists (source), she hopes her new role will help pave the way for family physicians who want to incorporate inpatient care into their practice. “Family physicians who work in both the clinic and hospital settings have a great understanding of the capabilities of both types of care, and the continuity between them,” she said. Dr. Bonk also leads several hospital-based projects focused on improving quality and safety, and teaches residents to do the same. For example, a recent project focused on reducing discharge delays: the time between when a patient is medically ready for discharge and when the discharge process is completed. After learning that 21 percent of discharge delays on D4/6 were due to the discharge medication reconciliation process, she collaborated with an inpatient pharmacist and residents on the service to implement two interventions. First, the team moved the pharmacist’s office into the residents’ workspace. This improved communication and facilitated the second intervention: to establish a daily meeting between the pharmacist and residents to prepare discharge medication reconciliations for the next day. The intervention resulted in a 35 percent reduction in discharge delay and an 88 percent decrease in pages between residents and pharmacists. Dr. Bonk presented the results of this project at the 2018 Family Medicine Midwest conference and the 2019 Society of Hospital Medicine Conference. She is currently working with a group of residents on a project to improve the care of neonatal patients with hyperbilirubinemia.